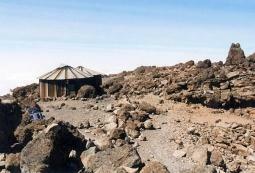 The Umbwe route approaches Kilimanjaro from the south. The route is a short, steep and direct one, and considered to be very difficult. 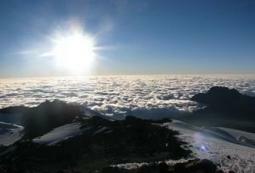 Due to the fast ascension, this route does not provide the necessary stages for altitude acclimatization. Although the traffic on this route is very low, the chances of success are also very low. 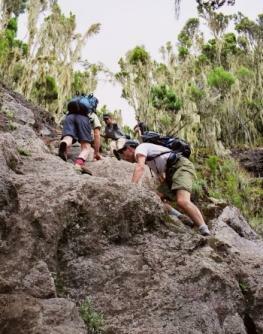 The route is offered at a minimum of six days, and seven days is preferred when attempting to climb using Umbwe. However, overall, the Umbwe route is not recommended. Walking time: 6 hrs. ; elevation change: +1,200 m.
After breakfast, we will drive to Kilimanjaro Umbwe Park Gate (1,700 m.), where we will register and then begin the climb. From here, the walk will take place in the forest through a narrow ridge between the Umbwe and Lonzo Rivers until reaching Bivouac No. 1 (known as the Forest Caves at 2,900 m.), where you will camp overnight. Walking time: 5 hrs. ; elevation change: +1,050 m.
After breakfast, we shall continue to follow the ridge, leaving the forest through open moorlands. In the moorlands, you will be able to see trees known as Erica arborea before reaching Barranco Hut at 3,950 m., where you will spend the night. After breakfast, you will continue by climbing a very steep rock called “Breakfast Rock” for approximately one hour. 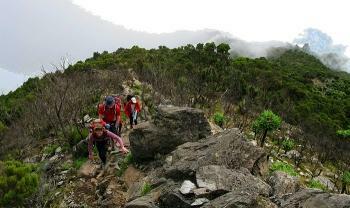 Then you will walk for a short distance before dropping to Karanga Valley, which is the last water point. Overnight will be taken here. After summiting, you will return to Barafu Hut for a short rest and a hot lunch, and you also will pack your gear to continue your descent. 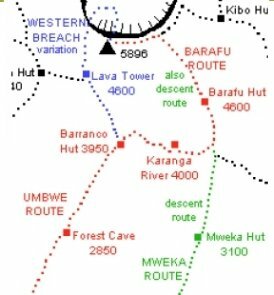 You will descend via the Barafu Route to Mweka Camp for approximately five hours. Dinner and overnight will be taken here. Walking time: 4 hrs. ; elevation change: -1550 m.
After breakfast, we shall descend through natural forest for approximately 10 km. to reach the Mweka Gate. Thereafter, our representative shall finalize all registration issues at the Mweka Gate Park and then return you to the Zebra Hotel in Moshi to complete your trek.